Both product and supplier have been through a careful and meticulous process of elimination, to ensure the high standard of products and services that Titan consistently delivers to its customers, will not be compromised. The Indent range of furniture is never too far from shore. Secure your order ahead of time and your project will run as smooth as clockwork. If you have a specific requirement outside what is presented here, please contact the team and they will endeavour to work with you on a solution. The range of readily available table bases, chairs and soft furniture at Titan, can quickly and easily have your order ready for shipping to your establishment within 5 days. Although for most organisations stocked product is, ‘as is where is’, here at Titan modification is always welcomed; it has always been a passion of Titan to provide what seems outside the norm. Adding additional comfort, changing heights or colour where possible, this is the added value we offer to our imported stock lines, which gives you, our clients, that ‘point of difference’. Titan has built a reputation over the past 41 years, for always backing up its product and service, and will ensure your requirements are met. Manufactured for one customer only! and Titan sticks to that. When a customer approaches Titan with a new design of the chair, table, or an inventive creation of furniture and asks for exclusivity, Titan honours that agreement. Titan Furniture developed its reputation more than 41 years ago with the ‘Gentleman’s Agreement’ and still stands by those principles to this day. Titan can work with mild steel and stainless steel in both tubular and flat form. There is a huge range of finishes available, ie, antiqued, zinc, galvanised, raw, powder-coated colours, bright chrome or brushed chrome, and stainless steel polished or brushed. Our furniture industry in New Zealand is internationally perceptive; we keep up with the trends and create some of the worlds’ most unique commercial environments. This is challenging, as the demand on manufacturers and importers to have a large standard range, is constant. This has allowed Titan to identify the need for one-off showcase pieces that fit specifically into any environment. In order to achieve this we have set up dedicated areas in our production lines that take on the challenges to custom build furniture in both short and reasonable time frames. The team at Titan have a collective knowledge base of over 40 years; this experience and expertise ensures any design will be manufactured to the absolute finest possible standard. Titan will always work on behalf of its many clients. When there is a requirement or a request for a complete measure and quote, Titan will be there with tape measure in hand, ensuring the correct information is gathered. Titan can function as a part of your operation. We can work in combination with your processes as a complimentary manufacturing source. Due to our specifically set up business units in upholstery and light engineering, we are pleased to be able to offer these services to increase our clients level of offering to the market. These are offered in a business relationship where we actively meet your capacity to fit your project, over and above our standard production. In the current fast-moving market, Titan recognizes that it needs clients who have the same can-do attitude as us. We know that we are only as good as the companies we have to support us. We recognize in this industry your company image is based on the last fit-out and we all must continually demonstrate our highest standard. Using Titan to complete your subcontract services will only increase your exposure as market leaders in the fit-out arena. In today’s environment companies are taking an environmental view at how they buy and create their new fit-out requirements. Furniture can make a space more functional and even unite colleagues creating a more effective business unit. In order to achieve this you need to either replace your existing furniture with new, or refurbish that tired old piece, bringing new life and form into that space. reused materials and how we recycle. Foam is recycled into under flooring or bonded commercial foam. Solid timbers are cut into firewood for our staff in the winter. Engineered timber products (MDF, fibre board and particle board) are sent to appropriate factories for recycling. We endeavour to re-use what we can without sacrifice to the quality or comfort. Professional upholstery cleaning and scotch guarding can be offered as an add-on service while we work on your furniture. One treatment can provide long term protection against stains and general wear and tear. Breathe new life into your upholstery and protect it for commercial environments. 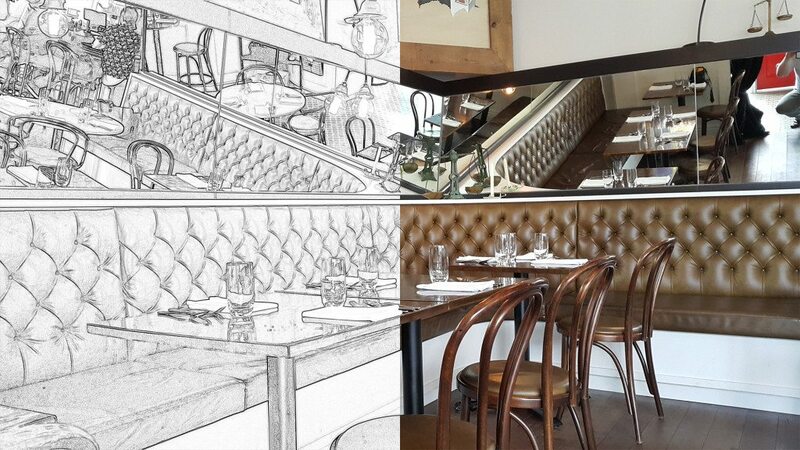 By refurbishing existing furniture Titan can help drive for a more environmentally focused fit out. 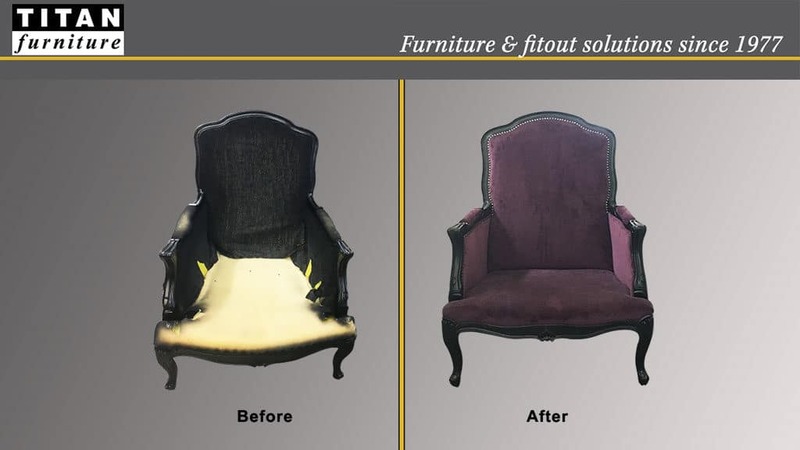 We have the ability to restore or even transform your existing furniture in line with the current trend and style; changing shapes or extending the frame to become more collaborative or functional.